Kremlin Closely Watches NATO' Build Up In Arctic. 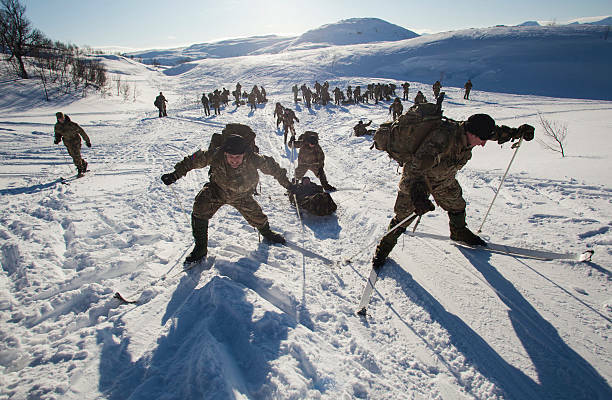 NATO: British Royal Marines pulling and pushing sleds bearing during the medevac military exercises of March 3, in 2013 at the Allied Arctic Training Center in Bardufoss, Norway. Russia on Thursday warmed Norway of pushing ahead with a military build-up which it said increased the risks of military action and required some kind of Russian response. Maria Zakharova, a spokeswoman for Russia’s Ministry of Foreign Affairs, said Moscow had watched as NATO member Norway had become more and more active in helping the Western military alliance build up its presence in the Arctic region. Norway, which shares a 196-km (122-mile) land border with Russia, has said it is concerned about Moscow building up its own military capacity on the Kola Peninsula, a region dotted with naval bases and restricted military zones. Norway in October hosted a huge NATO exercise in the region.